I'm sure you are all familiar with dividend stocks. But did you know there is a class of dividend stocks that can return up to 20% and more? I'll tell you more about them in a minute, but first let's look at why dividends are so important for every investor. Keep in mind that over those 25 years, we've seen two major market crashes. But solid dividend stocks have weathered the storms and continued showering shareholders with cold, hard cash. They have outpaced the market as a whole, and with far less volatility. In other words, dividend stocks are not only safer — but they pay you to own them. But there are two ways of thinking about dividend stocks — as short-term income while the market works itself out, or as a long-term investing plan. It's all a matter of your time frame: do you want a guaranteed 20% kickback right now, or would you rather slowly build your portfolio to eventually double your money over a couple of decades? Memorial Production Partners LP (NASDAQ: MEMP) — 29.27% Memorial Production Partners LP is an upstream Master Limited Partnership (MLP) focused on the acquisition, production, and development of oil and gas properties in the United States. Ferrellgas Partners L.P. (NYSE: FGP) — 27.41% Ferrellgas Partners, L.P. distributes and sells propane and related equipment and supplies primarily in the United States. Equity Residential (NYSE: EQR) — 20.40% Equity Residential, a real estate investment trust (REIT), engages in the acquisition, development, and management of multifamily properties in the United States. TICC Capital Corp (NASDAQ: TICC) — 18.65% TICC Capital Corp. is a business development company and operates as a closed-end, non-diversified management investment company. The firm invests in both public and private companies. Resource Capital (NYSE: RSO) — 18.10% Resource Capital Corp., a diversified real estate investment trust, primarily focuses on originating, holding, and managing commercial mortgage loans and other commercial real estate-related debt and equity investments in the United States. This data is according to Dividend.com, and these numbers change drastically every single day. Which is to say, do not start dumping money into them based on the dividend alone. You can see that the highest dividend comes from an MLP, or master limited partnership. MLPs are most typically in the energy industry, providing and managing resources such as oil and gas pipelines. Now, as you can see, they do pay out a handsome dividend, but the drawback for me is that they are heavily affected by commodity prices and the stock price can swing wildly based on factors completely out of your control. These are companies that have been solid enough to increase dividends each and every year for the last 25 years. Some of these are household names like AT&T (NYSE: T) and Coca-Cola (NYSE: KO) and some lesser known companies like Nucor (NYSE: NUE) and Illinois Tool Works (NYSE: ITW). Not only have they been rewarding investors with ever-increasing checks, but the companies themselves have outperformed the market. Hormel Foods Corp. (NYSE: HRL) has increased its dividends for a solid 50 years. Johnson and Johnson (NYSE: JNJ) has upped its payouts for 54 years in a row. And Proctor and Gamble (NYSE: PG) has raised its dividend for a whopping 60 years running. Dividend Kings have also outperformed the S&P 500 by a resounding margin. Over the last 15 years, the S&P has averaged around 9.8% a year. Dividend Kings have returned over 14%. 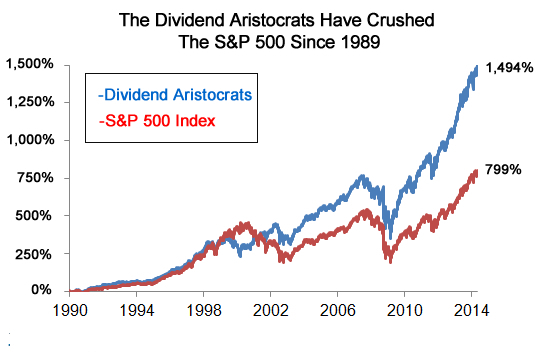 Now, the average dividend yield for Aristocrats and Kings is around 2.4% — not too shabby, but hardly the double-digit payout you could get with the companies above. There's no doubt about it, we will see stock market volatility — it's not a matter of if, but when. But when it comes, make sure you are getting paid handsomely either way. It's up to you if you'd rather get high yields right away, or solid yields long term. We'll be covering both in Outsider Club in the weeks to come, so stay tuned.